Please use the 'Archives' and 'Categories' menus below to help navigate the blog! ... made our own superhero masks and cuffs, as well as colourings and wordsearches, all whilst watching Danger Mouse! We have been learning about halving this week, using multilink blocks. It been pretty tricky but we're getting the hang of it now! We are continuing to practise counting objects up to 20 reliably, as this is what was tripping some of us up when we were trying to halve numbers practically. Please practise this at home if you can! We went on a trip to Cardiff Bay today to start our new topic 'Cardiff Tales'. We looked at all of the significant buildings in the Bay, mapped them and did observational drawings. It was a little rainy but we still had a great time! 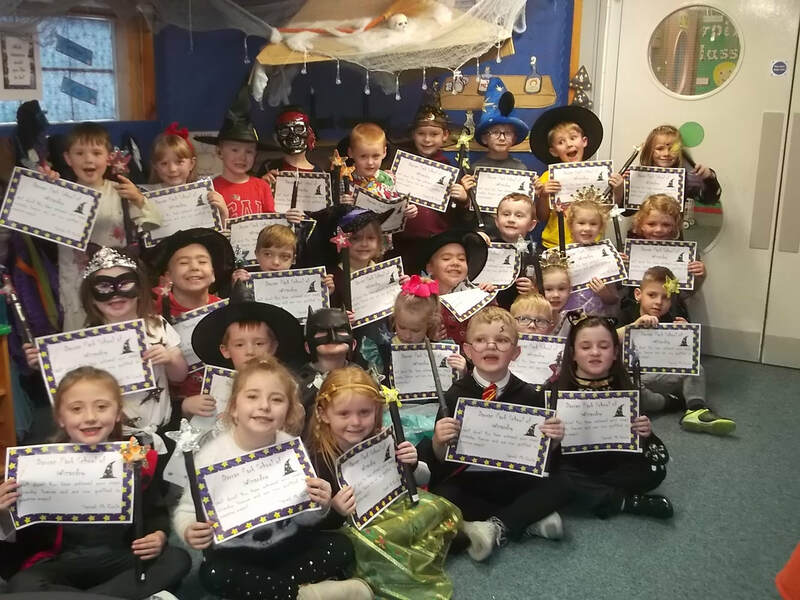 To finish our topic 'Muck, Mess and Mixtures', we had the presentation of our wizardry licences this afternoon and made our very own magic wands. We completed another spread the happiness challenge this week- we had a big block of ice with sweets frozen inside it and we had to smash the ice up to get at them! It was hilarious bashing at the ice just for the fun of it, we couldn't stop laughing! In our enhanced provision areas, we have been carrying out lots of magic activities that we planned in our COOL time session. COOL stands for 'Choose Our Own Learning'. In the 'tuff spot', we have been using mini broomsticks to dust away magic glitter to find 'oo' words and then putting any words we find that are real into our cauldron. In the creative area, we have been making potions in the playdough. In the literacy area, we have been writing adjectives to add to our own spells and potions recipes. In the numeracy area, we have been making symmetrical witches' hats. Our favourite however is the role-play area, where we have been pretending to be witches and wizards. We used our hands to explore four different materials- rice pudding, mud, cornflakes and spaghetti with paint. We then used the app 'Pic Collage' to record adjectives that described each one in pairs or groups. We have started our journey to becoming witches and wizards at the School of Wizardry this week! Level 1 meant that we had to help the witch to decide what the best ingredients for her potions would be. To do this, we chose different materials to feel with our hands and described them using an adjective. Once we'd done that, we worked with our partner to mix two materials together to create a mixture of our own and see if the texture of the materials changed. We recorded our findings by doing handprints of our chosen materials (including our mixtures at the end!) and writing an adjective underneath each one. We pretended to be characters from 'Room on the Broom' today and played 'Mae witch yn dweud.../The witch says...'. This is like 'Simon says...' but more magical! We had to decide whether the witch was saying a verb or a noun.